The following set of documents was released by U.S. Central Command on April 29, 2016. See also Medecins Sans Frontieres' initial review of the attack. The U.S. Central Command extends its deepest condolences to those injured and to the families of those killed in this tragic incident. We are fully committed to learning from this tragedy and minimizing the risk of civilian casualties during future combat operations. This document includes a summary of the investigation and key follow-on actions by senior commanders, and reflects our commitment to transparency and improvement. U.S. Army Gen. John Campbell, then the Commander of USFOR-A, directed an investigation to determine the cause of this incident. The lead investigating officer was Army Maj. Gen. William Hickman. He was assisted by Air Force Brig. Gen. Robert Armfield and Army Brig. Gen Sean Jenkins. All three generals were brought in from outside Afghanistan in order to provide an objective perspective. The investigation team included over a dozen subject matter experts from several specialty fields. The investigative team visited the MSF Trauma Center site and several other locations in the city of Kunduz. 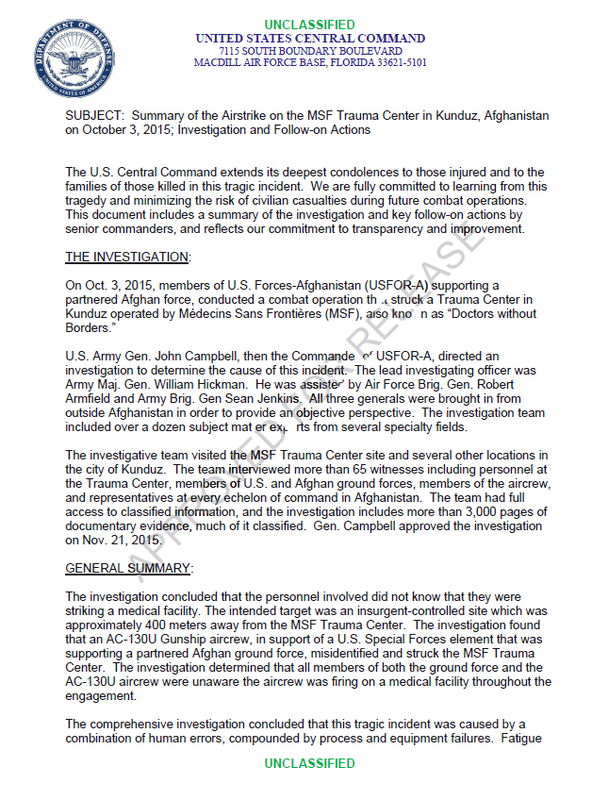 The team interviewed more than 65 witnesses including personnel at the Trauma Center, members of U.S. and Afghan ground forces, members of the aircrew, and representatives at every echelon of command in Afghanistan. The team had full access to classified information, and the investigation includes more than 3,000 pages of documentary evidence, much of it classified. Gen. Campbell approved the investigation on Nov. 21, 2015. The Commander of USFOR-A concluded that certain personnel failed to comply with the rules of engagement and the law of armed conflict. However, the investigation did not conclude that these failures amounted to a war crime. The label “war crimes” is typically reserved for intentional acts intentionally targeting civilians or intentionally targeting protected objects. The investigation found that the tragic incident resulted from a combination of unintentional human errors and equipment failures, and that none of the personnel knew that they were striking a medical facility.